Click on the first link at the top to see our huge inventory of lifeguard t-shirts, sweatshirts, clothing, apparel, uniforms, and jackets. Due to having the most wide selection, we are the most popular lifeguard shirt website in the world. We also have a robust supply of Lifeguard Equipment and supplies. We are your one stop shopping for all your lifeguard needs. Whether it be t-shirts for your staff, or you need an entire inventory stock of equipment, we are the lifeguard store that has your needs. 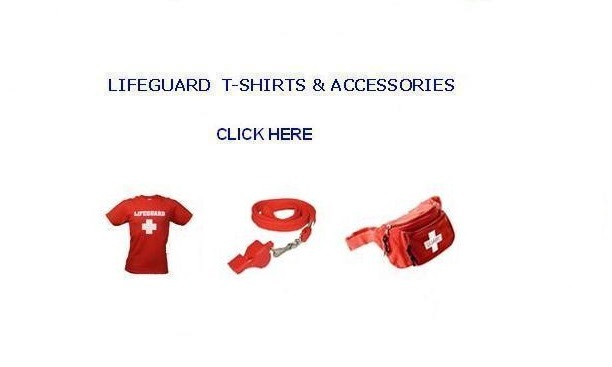 Some of our most popular apparel include lifeguard t-shirts, tank tops, sweatshirts, hip packs, and whistles. Some of our most popular equipment include rescue tubes, CPR Masks, bullhorns, and diving bricks.